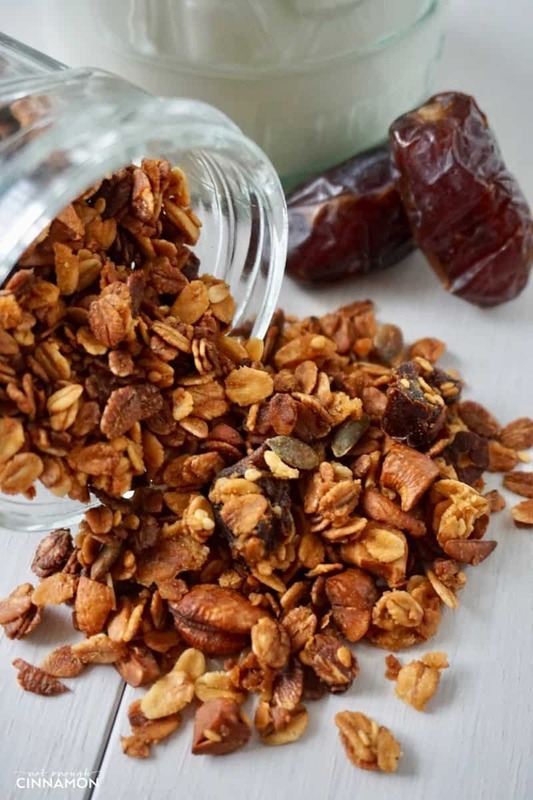 An easy homemade honey granola recipe featuring Medjool dates and cashews. The perfect sweet treat for breakfast – delicious on its own, sprinkled over some Greek yogurt, or used as a smoothie topping! Homemade Granola vs. Store-bought – why should I make granola at home? If you’ve never made homemade granola and usually buy it already made, let me try and make a case for it. First, let’s talk *yum factor*. Homemade granola often tastes much better – partly because you can make a granola that’s “yours”. 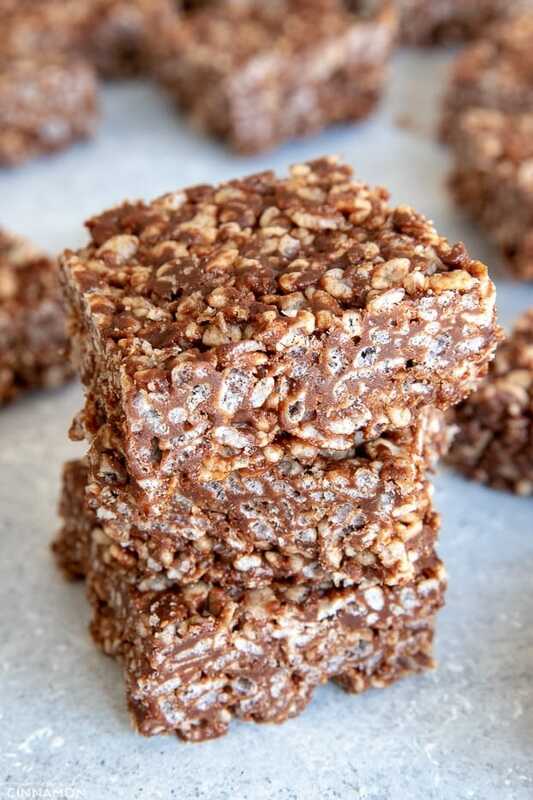 You can go ahead and use ingredients (nuts, seeds, spices, oils, dried fruits) and sweeteners (honey, maple syrup, coconut sugar, rice malt syrup…) to perfectly match your taste. 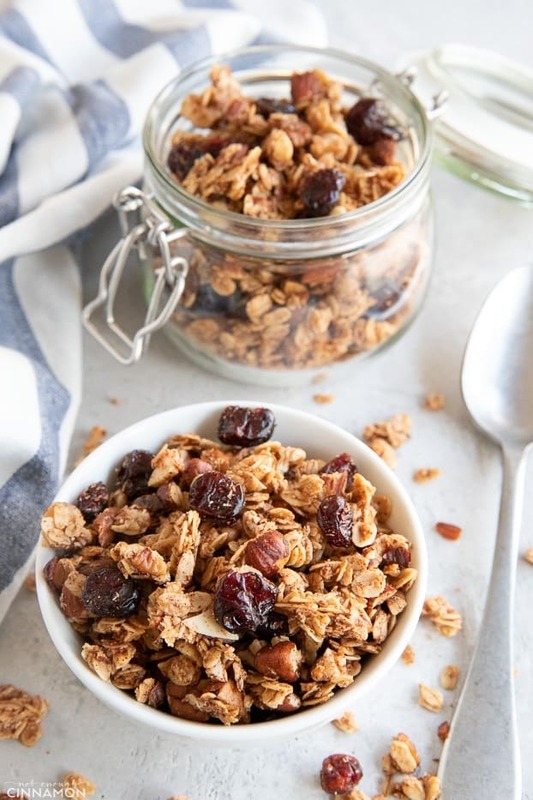 And then, there’s the fact that store-bought granola is often loaded with sugar and oil, making it a not-so-healthy option contrary to what a lot of people think. Granola is branded as “health food” in stores, but when mostly, it’s really cleverly marketed sugar. When you make homemade granola, using f.ex this honey granola recipe, you know exactly what goes in it and you can control the amount of oil and sugar. Much better! And I get that it’s convenient to just buy it instead of making it – convenience is big for me too! 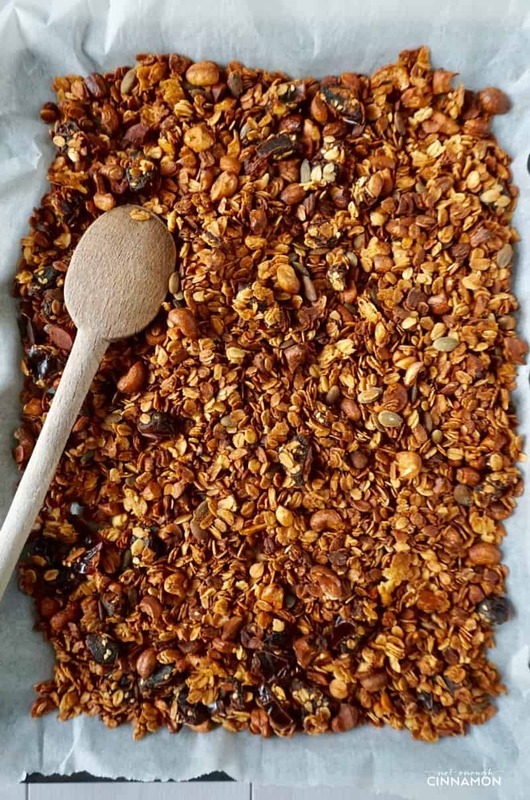 But really, this baked honey granola recipe super easy to make (the oven does most of the work for you) and you can store it for a few weeks easy, no need to remake some every 3 days. Naturally sweetened with a touch of caramel taste – this baked honey granola recipe is a winner! In this honey granola recipe, I’m using honey as the main sweetener (but not too much of it!) and the Medjool dates add another layer of sweetness and a touch of caramel taste. In addition to the crispy oats, we get additional crunch from the cashew nuts and the pumpkin seeds. You’ll see that I only use two tablespoons of coconut oil – you really don’t need more than that. 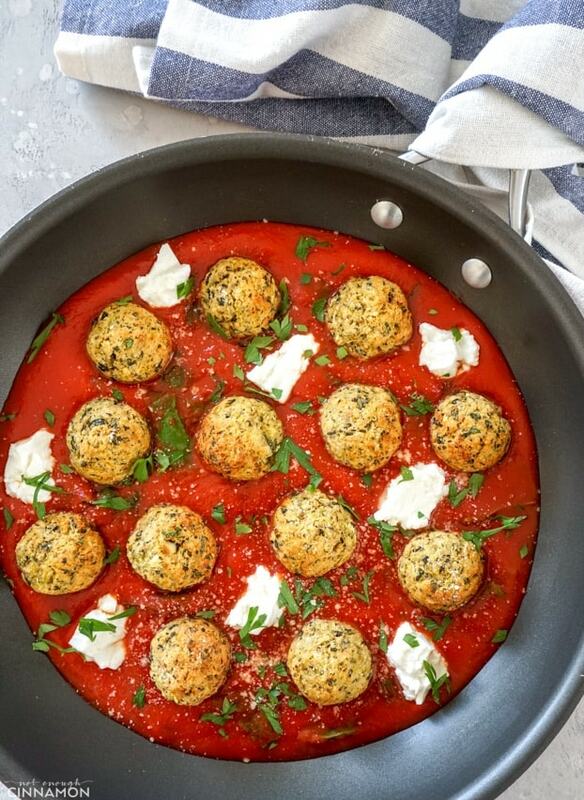 For an added subtle flavor, you could use light olive oil instead – it’s delish too! 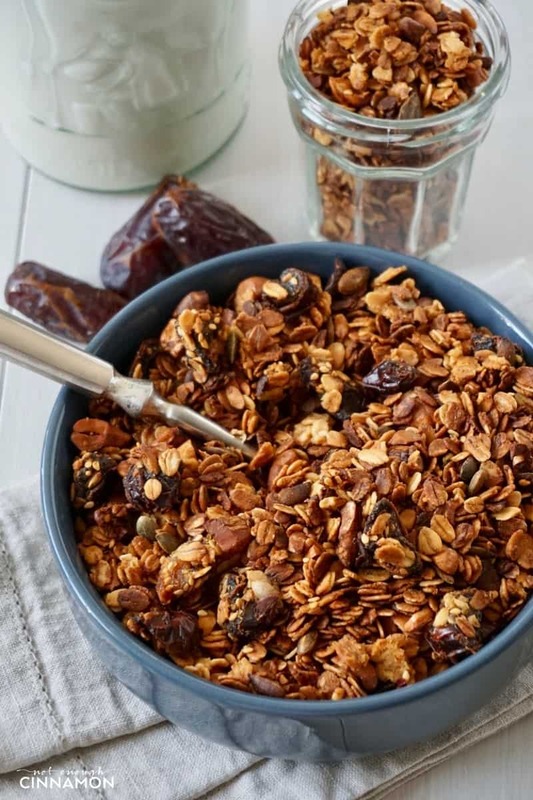 If you tried this honey granola recipe, don’t forget to rate the recipe below and let me know how it went in the comments – I love hearing from you! You can also follow me on Instagram, Pinterest, and Facebook for more deliciousness and behind-the-scenes! An easy homemade granola recipe featuring Medjool dates, cashews, and honey. Perfect for breakfast sprinkled over some yogurt, as a smoothie topping, or on its own as a snack! Preheat oven to 320 F - 160 C degrees. Line a baking sheet with parchment paper and set aside. In a large bowl, combine oats, cashews, dates, sesame seeds and pumpkin seeds. In a small saucepan, combine together water, honey, and coconut oil. Bring to a boil. Pour over oat mixture and stir until well combined. Spread on a prepared baking sheet in one even layer. Bake for 45 minutes or until golden, stirring from time to time. Remove from the oven and let granola cool completely, directly on the baking sheet (to make it crisp!). Serve immediately or store in an airtight container for up to 3 weeks. It's delicious as a topping for yogurt and smoothies for breakfast or on its own as a snack. I could munch on this all day long! My boys would love it too! Thanks so much Edyta – I love this combo too! It’s so I can eat more of it! haha. Thanks Joyce! I can’t believe I’ve never thought to add cashews to my homemade granola! They’re my favorite nut! Also, love the inclusion of dates. I’ve seen a lot of granola recipes lately, but this one really stands out. Aw thank you Dana! Cashew isn’t a “traditional nut” for granola but I loved this addition! This granola is so perfect for an afternoon snack or for breakfast. Yummy. Love all your recipes, thank you for all the work you do for others! Aww thank you so much Elaine, it means a lot! Thank you, Marie, for not deleting me from your email list. Sorry that I was not able to respond to your email right away. We have been traveling, at this moment we are visiting Uluru but for this winter we are based in Canberra, far away from home (Brandon, Manitoba, Canada) where it had been -50C with the windchill lately. I’d like you to know that I value the clean-eating recipes that you post on your website. Please keep up the good work, I am pretty sure that there are many others like me who are very appreciative of what you have been doing. Teddi. 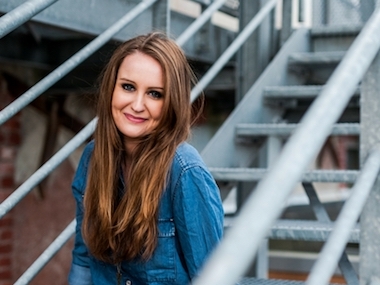 No worries at all – I know people don’t always have access to their emails straight away. I’ve heard it’s particularly hot in Australia this summer (at least in Sydney, where it’s crazy hot!) so it must make a big difference from what you’re used to normally during this time of year in Canada! Enjoy Australia and your family!! This honey granola sound super!! Made this on the weekend breakfast, Thanks for sharing!! So glad to hear Aria! Marie, I’m not at home now but as soon as I return I’ll make that super granola. Thank you for all your great thoughts. Hi Marie…the granola recipe is yummy; I added about 1 1/2 tsp of cinnamon and substituted honey with maple syrup. It was very good! Thank you! This is one great looking granola recipe! I love the different layers of sweetness you created in this one. I have never made granola with olive oil but now you’ve got me curious! However, I actually really enjoy the taste of coconut oil so I might stick to that! I went to make granola this morning and was bummed we didn’t have almonds. I just happened to google “cashew granola” and your recipe popped up! It was wonderful! I made it exactly as written. Even my kids, who are not crazy about cashews, said it was great with the other ingredients. This recipe is a keeper, thank you! 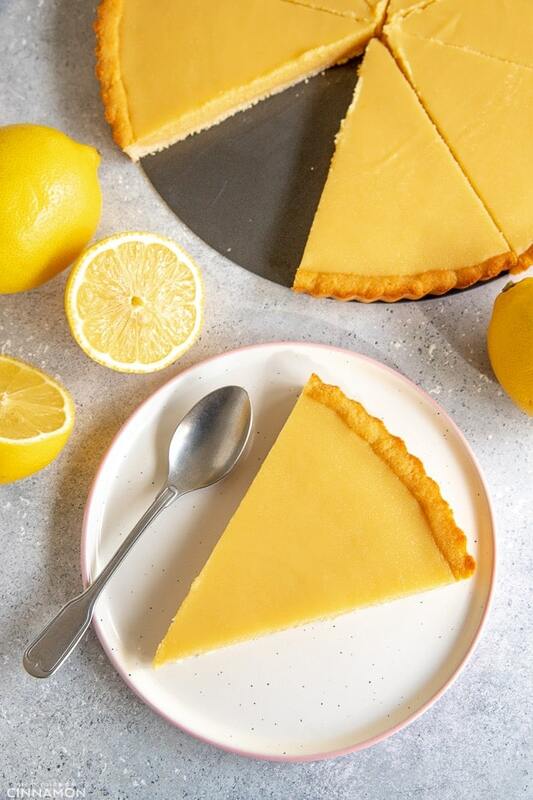 So happy to hear you found my recipe and all loved it Janelle, thank you!